Walk-in Cooler Shelving by E-Z Shelving Systems, Inc.
E-Z Shelving Systems has been manufacturing heavy-duty walk-in cooler shelving since the early 1970’s, and is widely recognized to provide the most versatile, space-efficient walk-in shelving on the market. Click the photo to open a walk-in cooler shelving photo gallery. 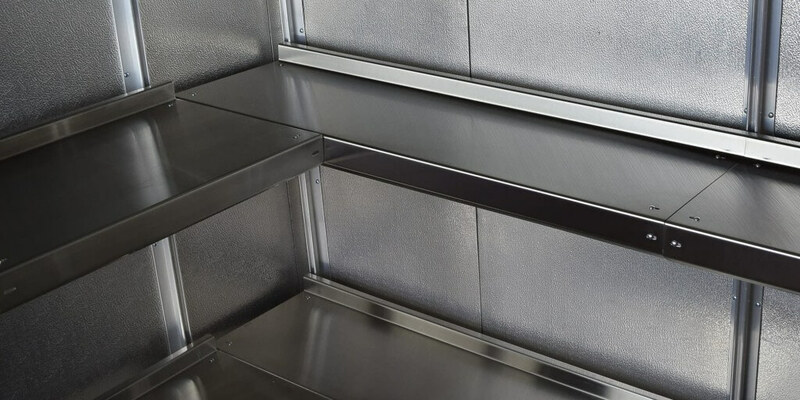 You can easily retrofit a cluttered cooler with E-Z walk-in shelving components. Our system delivers full shelf loading capacity on aluminum skins as light as 26 gauge with no blocking or backing. 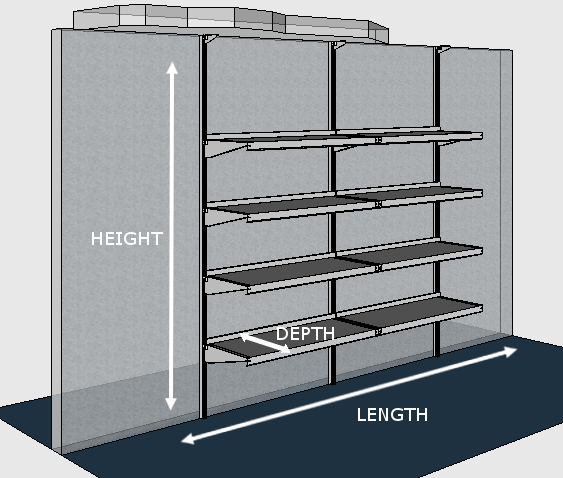 E-Z Shelving’s cantilever design eliminates the front posts that restrict floor space. By moving product onto our wall-mounted shelves you can free your entire walk-in floor, making it easier to clean, and easier for your employees to maneuver dollies, pallet-jacks and carts. A clean, free floor helps improve employee safety. Speaking of employee safety…Are you dealing with rickety racks? An E-Z cantilever walk-in cooler shelving system provides the stable, wall-mounted surfaces employees need for safe loading and unloading. For help completing this form, or to request a quote by phone, please call (800) 353-1331. The following picture shows an E-Z Shelving "Run" consisting of four "Tiers" of shelving. Please measure the length of the shelving run you require, as well as the height of the walk-in wall on which it will be installed (both in inches), and proceed to the next section of the quote form. More than one shelving run required? Upload a drawing or describe it below. Standard Shelf Depths: 6", 8", 10", 12", 14", 16", 18", 20", 22", 24", 26", 28", 30"
Wire Shelf Depths: 12", 15", 18", 21", 24", 30"
Describe any other important details in connection with this project. RUN 2: 4' Length, 8' Height, 18" Depth, 4 Tiers (near door) - and so on. Please upload photos or drawings of the walk-in wall(s) on which the shelving run will be installed. Please be sure to include any features in the area of the proposed run, such as doors or molding.